View of “Los Angeles Museum of Ceramic Art,” 2010. Perhaps a glut of cold Conceptual “strategies” in art, and virtuality in the digital world, has left us hungry for matter—for texture, grit, and mud. Whatever the root, ceramics has looked especially appealing lately, with its lean toward tactility and accidents. “Los Angeles Museum of Ceramic Art,” organized by artists Roger Herman and Monique Van Genderen, is titled in jest, since no such museum exists. 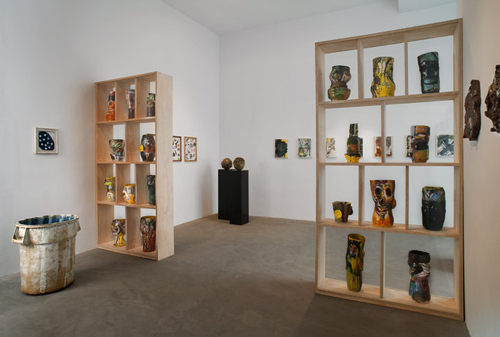 But this exhibit, which features 150 works by twenty-four Los Angeles–based artists, offers such a marvelously varied range of approaches to clay—as painting, vessel, totem, tile, or frieze—that it warrants the lofty title. Adrian Saxe’s lustrous half-spheres on the wall are reminiscent of Robert Irwin’s hovering discs, but a corroded and metallic version, although still as otherworldly (they were made in 1968; the rest of the show is primarily from 2009–11). Two other wall-mounted series stood out: the duo Two Serious Ladies’ “Caveman Photographs,” 2010, offers three slabs of flattened clay into which keys, USB cables, a credit card, and headphones have been pressed to leave markings. The clay tablets are glazed in a mild palette and hang by electrical cords. On the earthier end, Kelly Breslin’s “Fragment (for Agnes Denes),” 2010, features brown mounted hunks, heavily textured by jabs and holes, and strewn with small puddles of glaze. Resembling pieces of rock cracked off of a tide pool, they seem close siblings to Denes’s mystical earth works. Other highlights are Julia Haft-Candell’s Pink, 2010, a delightful mess of grids and cubes embellished with thread, teetering glossily on a rusty metal chair. More recognizable (and startlingly so) are Matthias Merkel-Hess’s life-size casts of trashcans, plastic buckets, milk crates, and Kitchenaid mixers. Expertly glazed in acidic washes or smooth mattes, or rough and peeling in burnished scraps, the humble trashcan never looked so lovely.